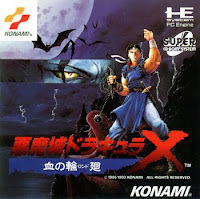 OK, I know Castlevania: Rondo of Blood (aka Akumajō Dracula X Chi no Rondo, aka "the best Castlevania ever") made it out of Japan and into Australia, Europe and the States in late 2007 as part of Castlevania: The Dracula X Chronicles. That doesn't mean squat to all of us who don't have a PSP, though--or those of use who want to play the original version of Rondo of Blood on a big, as opposed to little, screen. All of those folks finally have reason to applaud--or at least break into a huge, toothy grin: The Entertainment Software Rating Board has officially rated Rondo of Blood for release in the States. Now, there's no saying when the game will be added to the U.S. version of the Wii Virtual Console, but hopefully it'll happen sooner rather than later--especially considering it was added to the Wii Virtual Console in Japan all the way back in April 2008. I hate to admit this, but I don't know whether the game has been rated for release by the Australian or European ratings boards, so I'm not sure if or when it will be released in those territories. If any of you know, tell me, OK? Oh great! Another Castlevania I will have to wait for with baited breath. But really, when this one comes out, I'll never see my boyfriend again unless he's parked in front of the Wii playing this game. It's the only other Castlevania besides The Adventure that he's never played. I can't wait to hear what you two think of it (assuming you buy it and play it). It's actually my favorite Castlevania. Of course, I'm a bit biased, as I have a huge soft spot in my heart for PC-Engine games.